IM Plus - Messengers Unite! In this day and age, most people have multiple messenger profiles they use to connect with friends and family. I happen to have active accounts with Gtalk, ICQ as well as MSN. Instead of having to sign in to each messenger individually, I’ve decided to try out IM Plus, an app that let’s you connect to several messengers at once. The application is meant to enable users to access multiple IM services without having to install each chat messenger individually. I happen to use just three IM clients, but IM Plus let’s you add as many as you like. At start-up you are given the option of purchasing the ad-free premium version directly from the developer’s page for $4.95 (3.58 Euros). Once you’ve decided which chat client you’d like to use, you are quickly redirected to the login page located directly in the app. After setup, you can view a list of all your added accounts and select a buddy from any network to chat with. In Advanced Settings, you have the option of activating power save mode that saves you battery power, but also disconnects all conversations as soon as your device goes into sleep mode. You can also accept or turn down invites and adds directly with the app without having to go to your computer. 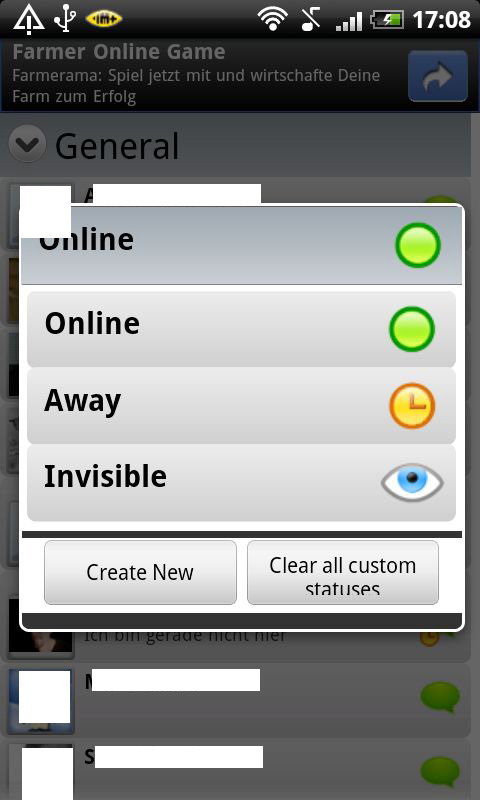 Your contacts can be seen in a list featuring their statuses and profiles pictures. 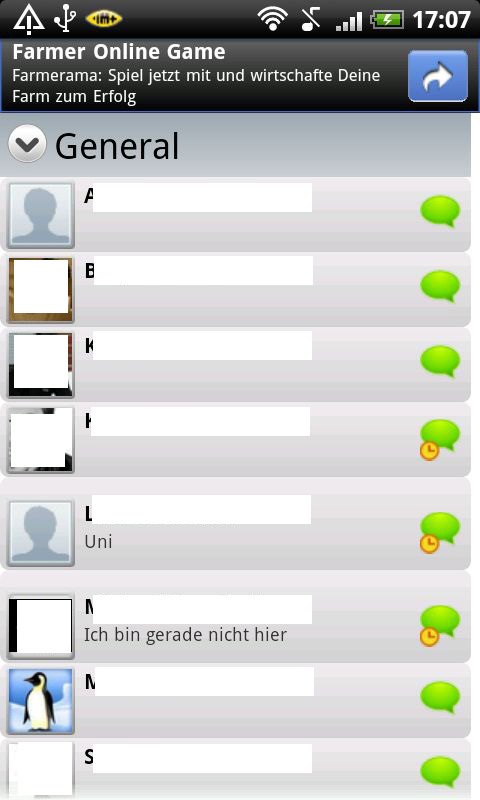 To start a conversation, just type in text or emoticons into the text field and press Enter. During my test the chatting worked perfectly and the chats were clearly displayed. Furthermore, you have the option of viewing information about a contact or look back at your chat history – something that comes in handy with longer conversations. 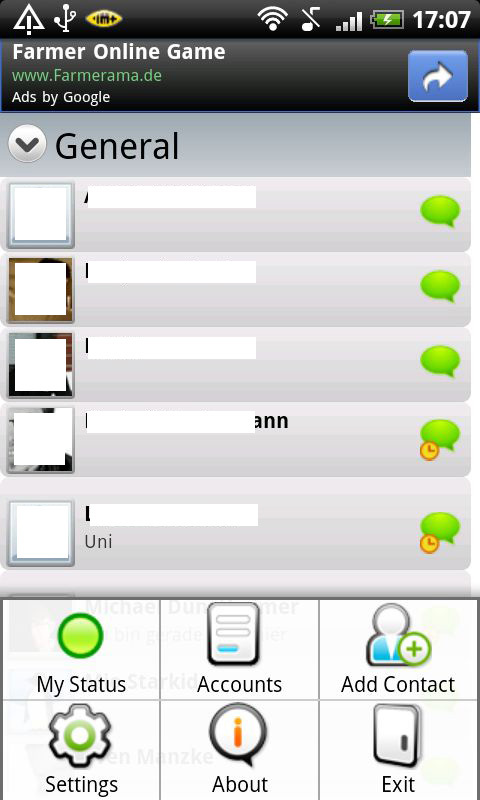 All open chat windows are displayed in your contact list, so you can chat with several people at once. While chatting, you can switch between chat screens by pressing the right or left arrows. This way you don’t have to go back to the main page to switch between conversations. Since I’m active with three messengers, this app is a must-have for me because it saves me the hassle of downloading three separate IM clients. Unfortunately, this app lacks Twitter, which is a shame for people like me that happen to tweet quite frequently. Last but not least, the app displays incoming messages in your status bar, letting you work on something else while chatting in the background. I would highly recommend getting a flat-rate data plan if you’re an avid chatter. Otherwise, you could be facing astronomical mobile internet bills because IM Plus runs in the background unless it is explicitly turned off. The menus are well-structured and give you a good overview. The Google Adsense ads at the top of the screen aren’t really a nuisance. IM Plus ran without any problems or lags. Chatting was quick and efficient. IM Plus can be downloaded for free from the Market, but there is also an ad-free premium version.